The Newest and Most Innovative Natural & Organic Options the Food Industry Has to Offer: My Personal Fave! Elise Deming is a registered Retail Dietitian Nutritionist in N.J. For more nutrition tips and recipes, visit her Instagram account @eat.with.elise. At the Specialty Food Show last month in Edison, N.J. I was able to see the newest and most innovative natural and organic options that the food industry has to offer. These included hemp and plant-based proteins, probiotics, crickets, and one of my personal favorites: pinole. Check out more below including a delicious recipe I’ve included for Pinole-Chia Pudding! For the purple layer, blend blueberries, milk, pinole, and cinnamon until liquid. Then stir in chia seeds. For the yellow layer, blend banana, milk, tahini, cinnamon, and honey until creamy. Then stir in chia seeds. Refrigerate both layers for a minimum of 45 minutes. Layer pinole and banana chia mixes. 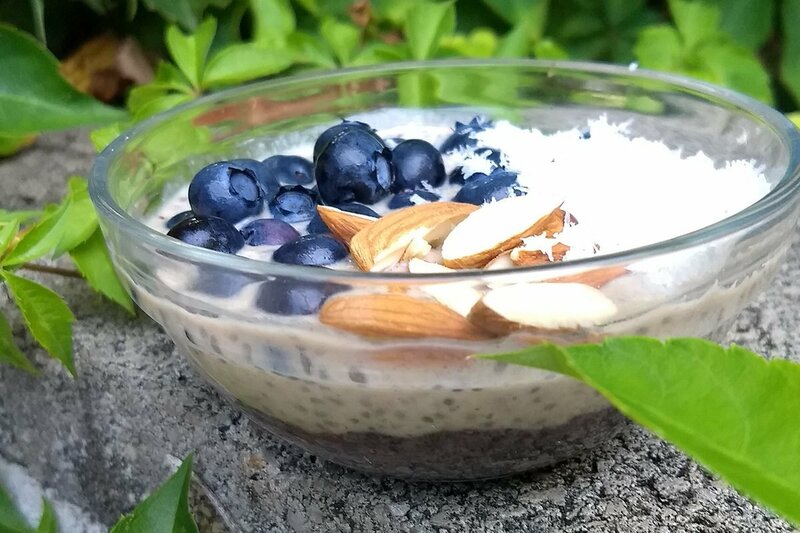 Top with coconut, almonds, and fresh blueberries. Enjoy! For full article visit philly.com.